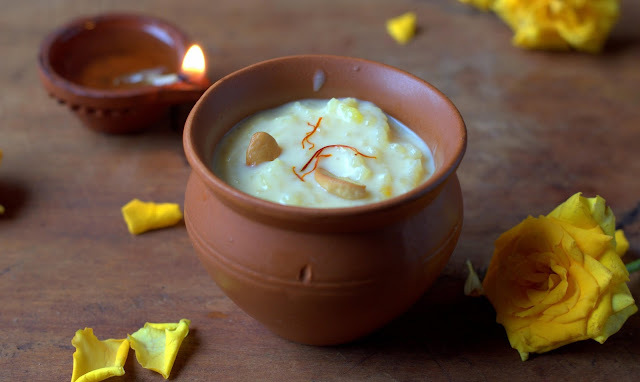 Cakes & More: The Last Minute Pressure Cooker Rice Kheer ! The Last Minute Pressure Cooker Rice Kheer ! It is literally raining mithai everywhere, more specifically on Facebook! Nothing less than a million ideas there, no exaggeration. And I swear, I have put on (more) weight just by looking at them! Like they say, technology isn't really good enough until you can download food! But till that day arrives, we will have to reach out for the real stuff, churn out deliciousness in our own kitchens. Thanks to my super-talented fellow bloggers and foodie friends who never fail to inspire! Made some Chocolate Fudge yesterday as the teenage son wanted to make something to take to school today. He wanted to make it himself as he is all of 13 now! But of course the enthusiasm was limited to chopping the toasted nuts, munching on them and eating pieces of the weighed out chocolate when I wasn't looking. Oh yes, he also stirred the fudge and later helped wrap them in cling-film. So much for 'making it'! My 8 year old daughter was content with taking some chips and noodles as instructed by her teacher(bless her) . But of course there had to be endless arguments for the fudge - and boy, can they do a good job of it! Just as well, Children's Day and class parties don't happen every day! And then I had just enough time and energy to make some quick and easy, creamy rice kheer in a pressure cooker. With minimal effort & active time you could make this pudding using pantry staples. No slaving over the stove or stirring for hours! Just the kind of traditional dessert you would want to make at the last minute for a festival or for unexpected guests. How much ever you may believe in the slow-cooked version, trust me, you want this recipe in your repertoire! Recipe from here, thank you for the lovely recipe Swapna! 1. Wash the rice and drain well. Fry the cashew nuts in ghee until light golden. Break them into pieces. Set aside. 2. Boil the milk in a 5 liter pressure cooker. Soak the saffron in about 2 tablespoons of this milk to use later. 3. Add the washed rice and the sugar to the milk. Stir to dissolve the sugar. 4. Close the lid, once steam starts appearing, put the weight on. Reduce the heat to the lowest. 5 . Cook for 1/2 hour. Turn off the heat. Let the pressure drop fully before opening the lid. 6. The rice would have been cooked and the milk will be very creamy. Add the saffron and stir. Taste and add sugar if needed. Cook on low heat for 5 - 10 minutes more. 7. Cool to room temperature, add the cardamom powder and the cashewnuts. The kheer will turn thicker as it cools, add the reserved milk as needed to adjust the consistency. 1. Milk :Use full cream milk for best results. Make sure you have extra full cream milk to adjust the consistency. 2. Sugar : Start with 1.5 cups. Increasing the sweetness is easier than pouring in more milk to reduce it. 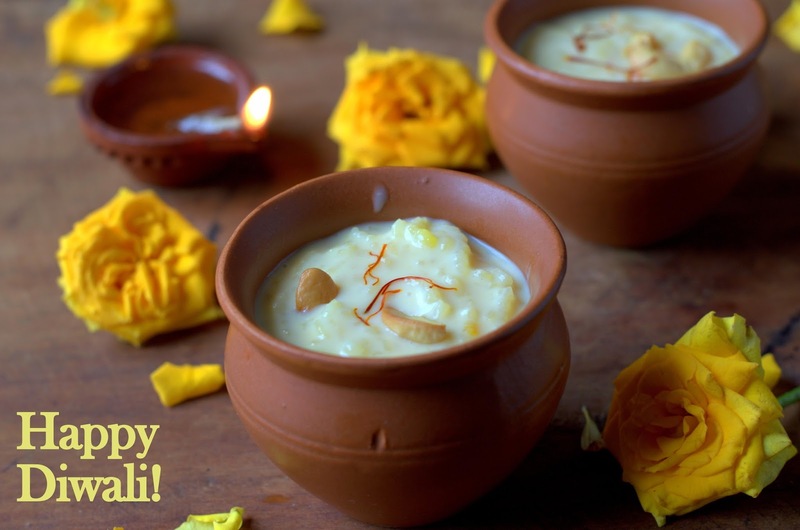 You may end up with a less creamy kheer if you add a lot of it later. 3. The cooking time may vary slightly depending on your pressure cooker. 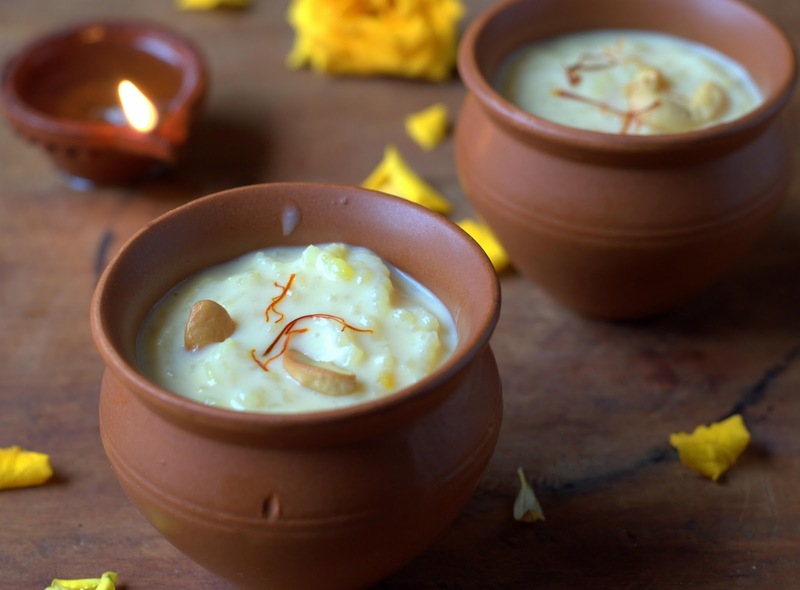 As long as the kheer doesn't burn or overflow, you can safely err on the side of over cooking it. 4. You could add the nuts along with the milk and rice, but I like the crunch it gives, so I add it later. 5. I made this kheer in a 10 liter pressure cooker for double the above quantity at my parent's place. The cooker chose to whistle and alarm me, cooking the kheer faster. It turned out just fine. 6. All ingredients measured using standard measuring cups and spoons. Happy Diwali to you and all in your family! Please do Divya! Happy Diwali to you! Hi Suma jii, your blog is really superb!! And worth viewing! In fact, I have tried to bake cakes many times and most of the trials were utter flops. I have come across your blog accidentally while searching for a baking course for beginners online. I have gone through your blog from the very basic start by step-by-step and watched all your videos as well – it is really fantastic. Then I started buying things and utensils as explained, 1st thing is a digital scale, as so on… After learning how to prepare batter, oven techniques, etc. when I felt it is fine to start practice, I have tried your simple vanilla sponge cake. I couldn’t believe me—it came out very well!! My husband and children finished it in no time. Then I made fruit plum cake for Christmas, my first black forest cake, butter cookies, chocolate cakes, cupcakes, etc. and even pizza also. Most of them were better than bakery bought items. Gone through the preparation of icing as well. Though not a very experienced baker, my family & colleagues in office love my bakes now. Thanks a lot Suma jeee, you are my energy---your blog and experience shared to beginner bakers like us. I made your Orange candy and used in plum cake. Everyone likes it. You are really a wonderful self-taught baker!! Thanks for sharing the information.